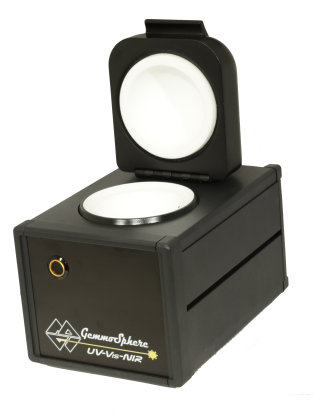 GemmoSphere™ is a small but powerful UV-Vis-NIR spectrometer specifically designed and built for diamond & gemological laboratories. GemmoSphere records gemstone's absorbtion spectrum at near-UV, visible and near-infrared wavelengts. It's main purpose is for verifying natural origin of colorless diamonds, but this technology is also widely used in other areas, such as for testing fancy colored diamonds, sapphires, emerald, spinel, tourmaline and jadeite. 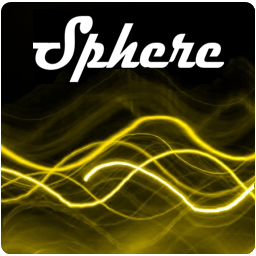 GemmoSphere™ works with the same familiar software as other MAGILABS products, provided with it's own growing UV-Vis-NIR - libraries. Works for loose gems from 0.01 to 50+ ct.
Place the gem table down in the sphere, close the lid & Go! GemmoSphere™ uses the same software as other MAGILABS products. Following easy steps, the AutoScan wizard produces high quality results starting from the very first use. No prior experience is required - just insert the sample, close the lid and go. The software is loaded with spectra of the most important gems, such as diamond, emerald, alexandrite, sapphire, garnets and jadeite. GemmoSphere's speed, light sensitivity and spectral purity is a result of 4 years study of searching the best optics, light sources, fiber optics and sampling geometry - specifically for testing gemstones. Just like in the case of our Raman products line, after careful investigation of various producers, we found there is no par for the World's #1 miniature spectrometer manufacturer Ocean Optics, USA. The GemmoSphere™light source has been spectrally shaped with a special set of optical filters for enhancing both blue and near infrared areas of the spectrum. 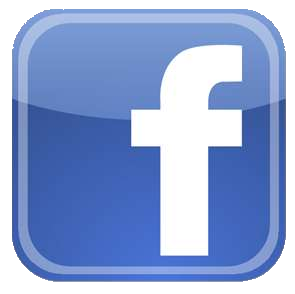 Additionally a series of balanced UV-sources are used for increasing the amount of UV-radiation. Finally, material with excellent UV- and blue light reflection properties has been used for manufacturing the integrating sphere. 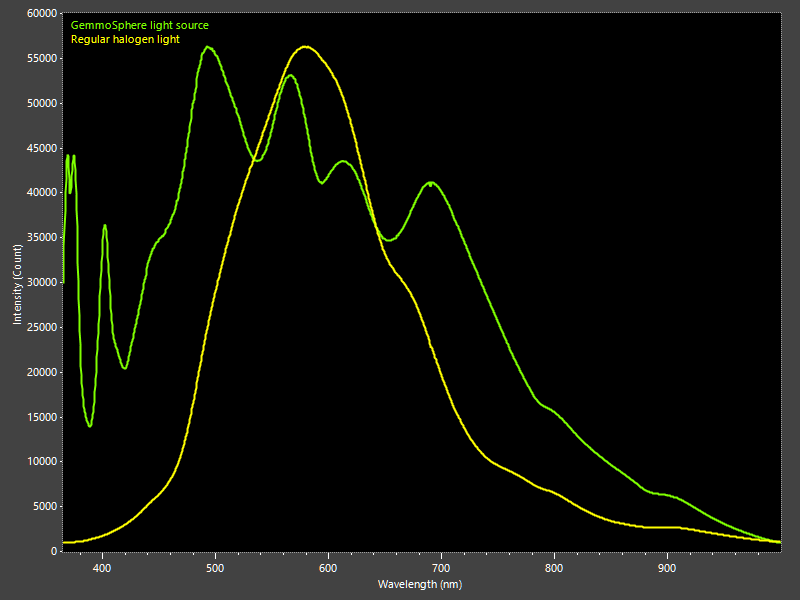 The image on left shows the difference between the raw spectra of regular halogen source used in most similar products (yellow line) and GemmoSphere's spectrally shaped light source (green line). 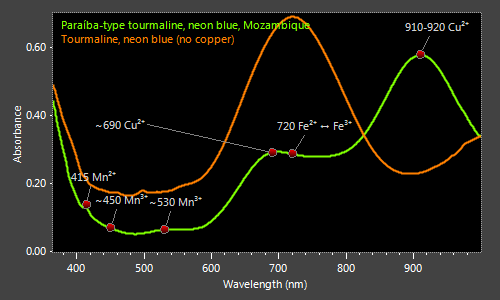 As a result of this spectral shaping we are happy to offer a gemology- oriented spectrometer producing noise-free results for the whole 365 - 1000 nm measurement range. The maximum noise-free absorption is about 3.0 (1/1000th of light passing trough the sample) at the UV & visible areas of the spectrum, and about 2.0 at the NIR-area. GemmoSphere™ can be installed by the end user and does not require for technician visit on site. The system is shipped with a laptop computer having pre-installed and tested software. GemmoSphere™ can be installed on any flat table surface, and has been designed to require only minimal maintenance. The only consumable is the halogen light source which can be changed easily to a new one by the end user. MAGILABS Warrants to the original purchaser of the GemmoSphere™ that the unit will be free from defects in material and workmanship for a period of 24 months from the date of original shipment.